This listing is for a pack of 10 x 15mm round lights and includes all the necessary wiring / transformer to make the installation a simple process. Each individual light is IP66 rated and fitted with a generous 5 Metre lead which simply plugs into the 10 point junction box. You then have a further 10 metre lead from the junction box to the transformer which allows you to keep the transformer safely indoors. The deck lights each have 1 superbright LED encased in a waterproof sealed unit with a stainless steel fascia which guarantees the item will not become rusty if left outdoors over the winter months. The LED chips used on the lights are high quality branded chips which ensures they always maintain the same brightness / shade of White…. 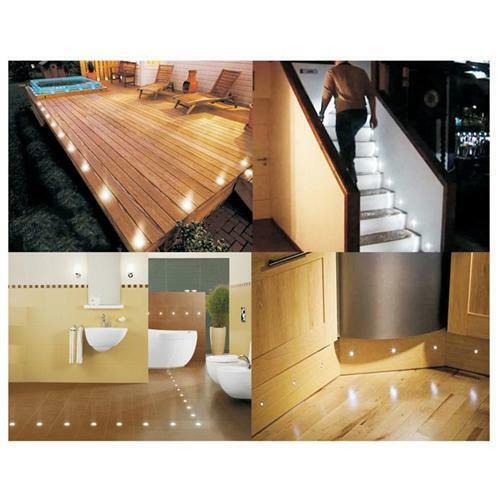 These LED deck lights meet all UK safety regulations (CE and RoHs) and we offer a one year guarantee to any customer whom purchases any item from us. Due to the high quality of our products and installation service we offer our items are regularly used in some of the UK’s largest shopping centres, hotels, Celebrity homes, etc... so please buy with confidence. Top Quality Product available at the UK's lowest price. For further information contact our sales team.